Back to the attempt to recreate this dish in the early 2000s. I remembered the steak had a lime marinade and some garlic, so I poured a bunch of Rose’s lime juice over the steak, sprinkled it with some garlic powder, and let it sit for a while. Needless to say, the steak tasted horrible. My boyfriend ate every last bit, though, and told me it was great. I still tell him he’s a liar to this day (or he was just really, really starved). My lesson was learned: Rose’s lime juice is not the same thing as lime juice, and my now husband will go to great lengths to spare my feelings. What made me decide to try, try again in recreating this meal, instead of heading down to my local Cuban restaurant? Lately there’s been a great run of overly ripe plantains available in the Bay area, so I decided why not give it another go. 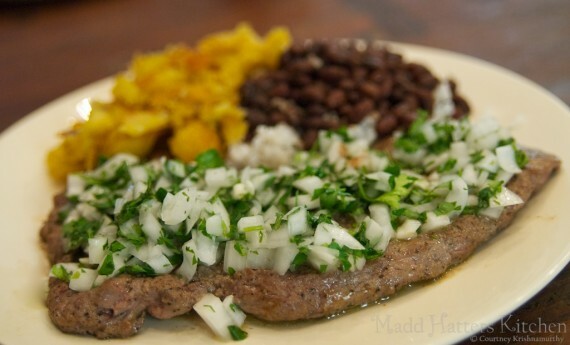 While I’ve had good palomilla steak here in the Bay area, I haven’t had one that lived up to my memories of the dish from Columbia restaurant. So I set upon a course to make the full blown meal – black beans, rice, plantains, and of course, onion-topped sirloin. I have to say, this turned out better than I remembered at Columbia! Plus, it wasn’t hard to pull together. While I have this listed as a Sunday supper, it’s definitely worthy of a quick and easy weeknight meal classification. Part of making it easy was picking up canned black beans, which I doctored up slightly, but were pretty good on their own. If you shop at Whole Foods, their brand of spicy black beans are amazing and need very little alteration out of the can (something I rarely say). The steak, beaten thin, cooks quickly, even if you prefer it cooked medium or medium well. The plantains might take the longest, but that doesn’t mean much. They are simply sauteed in butter and oil and finished with a bit of brown sugar. Do yourself a favor and make this quick meal one night. Pair it with my classic sangria to feel like you’ve been whisked away on an island vacation! Mix the salt and spices together. Generously season the steak on both sides, massaging the spice mixture into the beef. Cover, and let sit for 30 minutes at room temperature. Meanwhile, make the mojo. Combine all of the ingredients in a non-reactive bowl. Stir to combine. Heat the oil and butter in a skillet over medium high heat. in pan. Cook 1 steak, for medium rare about 1 minute on each side. Remove from heat and cover with aluminum foil. Add 1/2 tablespoon butter. Cook the other steak in the same manner. Remove from heat and cover with aluminum foil. Turn the heat down to medium low. To the skillet, add the lime juice, minced garlic, and the remaining 1/2 tablespoon butter. Deglaze pan and soften garlic (do not brown). Pour the juices/butter/garlic mixture from the pan over steak. Top with fresh onion mojo. Serve immediately. I used Whole Foods spicy black beans, which as I mentioned above, didn’t need much doctoring to taste good. I added half of a lime rind from the juiced limes to the pot of black beans which I had lightly rinsed. I seasoned the beans with a bit more salt, and a pinch of the steak seasoning that I had left over. If your beans are lacking flavor, I might add more of the seasoning, plus a 1/4 to 1/2 teaspoon cayenne pepper, a pinch of white pepper, and a little drizzle of olive oil (I prefer garlic flavored, but just adding a bit of fat will work wonders). Instead of just the lime rind, I would also give a little squeeze of lime juice from a wedge. Serve the black beans over steamed white rice. Just a note, the plantains must be really ripe – their peels should be black. Cut the plantains into 1/2 inch thick bias cut slices. Heat the oil and butter over medium heat in a skillet. Add the plantains and season with salt. Cook the plantains, making note of their shift in color from a pale yellow to a much more saturated golden color. As they turn golden, add 2 teaspoons brown sugar. Continue cooking, stirring frequently, until little bits of brown begin to show on plantains. Serve warm. I just had my first Cuban food experience at Columbia in Clearwater with my husband last week. I ordered this meal and just looked on Pinterest to see how to recreate it and I found your blog post! I love that this restaurant and meal was just as great 10+ years ago as it is today and has inspired more than one person! I’ll be sure to try your recipe!